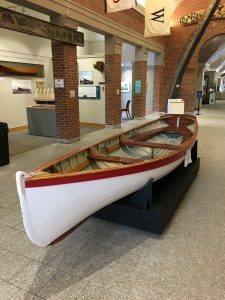 Maine Maritime Museum > All Posts > Win This Boat! Tickets for our 2019 raffle boat are now available! Originally built in Washington County in 1960 and restored by the Maine Maritime Museum Boatshop, this Whitehall pulling boat has an easily driven hull shape and is made of cedar on oak and bronze fasteners. Tickets are $5 each or five for $20, and proceeds support the Discovery Boatbuilding Program. The winner will be drawn October 15, 2019. Get your tickets here. Your ticket for the: Win This Boat!